The zygoma is the origin for the masseter, thus affecting mastication. The bones of the orbit create the inferior and lateral orbital socket, thus potentially affecting the correct position of the globe and mobility of the extraocular muscles. The infraorbital nerve passes just inferior to the orbital rim. Decreased sensation to the upper cheek skin, lateral nose, upper lip, and gums can occur with ZMC fractures. The ZMC provides lateral globe support necessary for binocular vision. The zygomatic arch is the insertion site for the masseter muscle and protects the temporalis muscle and the coronoid process. The frequency of ZMC fractures is second only to nasal fractures, which are the most common type of facial fracture. The prominent convex shape of the zygoma makes it vulnerable to traumatic injury, as seen in the image below. Even minimally displaced ZMC fractures can result in functional and aesthetic deformities. Successful repair of ZMC fractures requires an accurate diagnosis, appropriate surgical exposure, and precise reduction to reconstitute the complex 3-dimensional anatomy. Axial CT scan demonstrating zygomaticomaxillary complex fracture on right with severe displacement. For patient education resources, see the Back, Ribs, Neck, and Head Center, Breaks, Fractures, and Dislocations Center, and Eye and Vision Center, as well as Broken Jaw, Facial Fracture, and Black Eye. A much higher percentage of zygomaticomaxillary complex (ZMC) fractures occur in males (80%) than in females (20%). Incidence of ZMC fractures peaks in persons aged 20-30 years. Women who have been domestically abused are more likely to suffer ZMC fractures and orbital blow-out fractures,  while mandible fractures are more common when the female victim did not know the assailant. See Relevant Anatomy for a discussion of the impact of zygomaticomaxillary complex (ZMC) fractures on other facial structures. Many authors have devised classification schemes for zygomaticomaxillary complex (ZMC) fractures. [5, 7, 8] Zingg (1992) separates these injuries into types A, B, and C.  Type A injuries are isolated to one component of the tetrapod structure, including the zygomatic arch (type A1), the lateral orbital wall (type A2), and the inferior orbital rim (type A3). Type B fractures involve all 4 buttresses (ie, classic tetrapod fracture). Type C injuries are complex fractures with comminution of the zygomatic bone itself. These classification schemes are of little clinical significance; however, they are helpful in research and physician communication. Type A fractures are relatively uncommon. Type B and C fractures account for 62% of ZMC injuries. Types B and C fractures most commonly occur at the zygomaticomaxillary and zygomaticotemporal buttresses. The zygomaticofrontal buttress is the strongest of the 4 ZMC buttresses. Significant disruption at this site usually implies a high velocity injury with comminution in other areas. The weakest bone of the ZMC complex is the orbital floor. Type A3, B, and C injuries result in orbital floor disruption, which places the orbital contents at risk. The initial evaluation of facial trauma patients is focused on areas that can result in the greatest morbidity. Airway control and hemodynamic stability are the primary concerns. Next, spinal cord injury must be ruled out by a thorough clinical and/or radiological examination. Finally, any overt globe injury should be evaluated. After the patient has been stabilized, a thorough history can be taken and physical examination can be performed. A complete head and neck examination will reveal most bony or soft tissue injuries. When zygomaticomaxillary complex (ZMC) fractures are identified, an ophthalmologic consultation should be obtained. The most common symptoms associated with ZMC fractures include pain, edema, and ecchymosis of the cheek and eyelids. Malar flattening and palpable periorbital step-offs, often occur. The traumatic force and pull of the masseter muscle may result in medial, inferior, and posterior rotation of the zygoma. Trismus (ie, reduced jaw mobility) may result from compression of the zygomatic arch on the temporalis muscle and coronoid process. Orbital floor disruption can result in subcutaneous emphysema. Infraorbital nerve injury may result in anesthesia or paresthesias of the cheek, nose, upper lip, and lower eyelid. Jelks (1987) reported a 14-40% incidence of significant intraocular injury in patients with ZMC fractures that involved the orbital floor. For this reason, preoperative ophthalmology consultation is essential in patients with orbital floor injuries. Disruption of the bony orbit often results in expansion of the orbital volume and herniation of orbital contents. Inferior (hypophthalmos) and posterior (enophthalmos) globe displacement both occur. Extraocular muscle contusion or entrapment may result in diplopia. Upward gaze diplopia is most common, secondary to entrapment of the inferior rectus muscle and soft tissue surrounding it. However, any of the extraocular muscles may be involved. Comparing forced-duction tests on each eye can help to identify the specific site of muscle entrapment. This study is much easier to perform under general anesthesia. Evaluation of unanesthetized patients is often difficult because of poor patient cooperation. Compression of the orbital contents occurs less frequently. These injuries result in decreased orbital volume and displacement of the globe both superiorly (hyperophthalmos) and anteriorly (exophthalmos). These injuries are associated with an increased risk of optic nerve injury and visual loss. Physical findings such as severe conjunctival hemorrhage or hyphema are suggestive of direct globe injury, rupture, and visual loss. Visual compromise: Significant exophthalmos and orbital apex syndrome are indications for emergent surgical decompression. Extraocular muscle dysfunction: Muscle contusion, local tissue edema, or extraocular muscle entrapment and strangulation can cause extraocular muscle dysfunction. Edema and contusion usually resolve without long-term sequelae; however, muscle entrapment does not resolve. Muscle necrosis with long-term diplopia can occur if entrapped muscle is not released expediently. Globe displacement: Enophthalmos or hypophthalmos following acute injury becomes more pronounced with resolution of edema. Acute orbital dystopia requires surgical intervention. Significant orbital floor disruption: Large orbital floor fractures result in long-term enophthalmos and hypophthalmos. The definition of a "significant orbital floor injury" varies among authors. However, injuries encompassing 25-50% of the orbital floor have a higher risk of long-term enophthalmos. In these patients, orbital exploration with surgical repair should be considered. Displaced or comminuted fractures: These injuries generally result in cosmetic deformity and require surgical repair. The malar eminence is the most prominent portion of the zygomaticomaxillary complex (ZMC) and is located approximately 2 cm inferior to the lateral canthus. The malar eminence corresponds to the central portion of the ZMC. From this central position, 4 bony attachments to the skull are evident, namely, a superior attachment to the frontal bone (frontozygomatic suture line), a medial attachment to the maxilla (zygomaticomaxillary suture line), a lateral attachment to the temporal bone (zygomaticotemporal suture line), and a deep attachment to the greater wing of the sphenoid bone (zygomaticosphenoidal suture line). Some authors describe the zygomaticomaxillary and zygomaticosphenoidal suture lines as a single unit. Using this definition, ZMC fractures are called tripod fractures. However, the term tetrapod fracture is a more accurate description because 4 suture lines are disrupted. The term ZMC fracture describes a spectrum of injuries that includes nondisplaced fractures, fractures displaced at an isolated buttress, and severely comminuted fractures with bone loss. Information about the degree and severity of the overall injury can be extrapolated from the location of the fractures. The frontozygomatic and zygomaticosphenoidal buttresses are very strong. Isolated injuries in these areas are uncommon. When displaced fractures are noted, a high velocity injury with other associated fractures is likely. The inferior orbital rim is a common location for displaced and comminuted fractures. These injuries can be isolated, but they are often associated with orbital floor fractures. The zygomaticomaxillary buttress is commonly disrupted and associated with V2 paresthesias. Isolated injuries often occur in the zygomatic arch because of its length and unprotected location. Contraindications to surgical repair of zygomaticomaxillary complex (ZMC) fractures include medical instability and globe injuries. Orbital exploration in the presence of a hyphema or ruptured globe can result in exacerbation of the injury. Ho JPTF, Schreurs R, Aydi S, et al. Natural variation of the zygomaticomaxillary complex symmetry in normal individuals. J Craniomaxillofac Surg. 2017 Dec. 45 (12):1927-33. [Medline]. Donald PJ. Zygomatic fractures. English GM, ed. Otolaryngology: A Text Book. 1st ed. Hagerstown, Md: Medical Dept, Harper & Row; 1976. Arosarena OA, Fritsch TA, Hsueh Y, Aynehchi B, Haug R. Maxillofacial injuries and violence against women. Arch Facial Plast Surg. 2009 Jan-Feb. 11(1):48-52. [Medline]. Blumer M, Kumalic S, Gander T, et al. Retrospective analysis of 471 surgically treated zygomaticomaxillary complex fractures. J Craniomaxillofac Surg. 2018 Feb. 46 (2):269-73. [Medline]. Ellis E 3rd, el-Attar A, Moos KF. An analysis of 2,067 cases of zygomatico-orbital fracture. J Oral Maxillofac Surg. 1985 Jun. 43(6):417-28. [Medline]. Brucoli M, Boffano P, Broccardo E, et al. The "European zygomatic fracture" research project: the epidemiological results from a multicenter European collaboration. J Craniomaxillofac Surg. 2019 Jan 30. [Medline]. Yanagisawa E. Symposium on maxillo-facial trauma. 3. Pitfalls in the management of zygomatic fractures. Laryngoscope. 1973 Apr. 83(4):527-46. [Medline]. Knight JS, North JF. The classification of malar fractures: An analysis of displacement as a guide to treatment. Br J Plast Surg. 1961. 13:325-339. Jackson IT. Classification and treatment of orbitozygomatic and orbitoethmoid fractures. The place of bone grafting and plate fixation. Clin Plast Surg. 1989 Jan. 16(1):77-91. [Medline]. Jelks GW, La Trentra G. Orbital fractures. Foster CA, Sherman JE, eds. Surgery of Facial Bone Fractures. New York, NY: Churchill Livingston; 1987. 67-91. Strong EB, Sykes JM. Zygoma complex fractures. Facial Plast Surg. 1998. 14(1):105-15. [Medline]. van Hout WM, Van Cann EM, Koole R, Rosenberg AJ. Surgical treatment of unilateral zygomaticomaxillary complex fractures: A 7-year observational study assessing treatment outcome in 153 cases. J Craniomaxillofac Surg. 2016 Nov. 44 (11):1859-65. [Medline]. Fujii N, Yamashiro M. Classification of malar complex fractures using computed tomography. J Oral Maxillofac Surg. 1983 Sep. 41(9):562-7. [Medline]. Rozema R, Doff MH, van Ooijen PM, et al. Diagnostic reliability of low dose multidetector CT and cone beam CT in maxillofacial trauma-an experimental blinded and randomized study. Dentomaxillofac Radiol. 2018 Dec. 47 (8):20170423. [Medline]. Dreizin D, Nam AJ, Diaconu SC, Bernstein MP, Bodanapally UK, Munera F. Multidetector CT of Midfacial Fractures: Classification Systems, Principles of Reduction, and Common Complications. Radiographics. 2018 Jan-Feb. 38 (1):248-74. [Medline]. [Full Text]. Strong EB, Kim KK, Diaz RC. Endoscopic approach to orbital blowout fracture repair. Otolaryngol Head Neck Surg. 2004 Nov. 131(5):683-95. [Medline]. Cheong EC, Chen CT, Chen YR. Broad application of the endoscope for orbital floor reconstruction: long-term follow-up results. Plast Reconstr Surg. 2010 Mar. 125(3):969-78. [Medline]. Imai T, Michizawa M, Fujita G, et al. C-arm-guided reduction of zygomatic fractures revisited. J Trauma. 2011 Nov. 71(5):1371-5. [Medline]. Ji SY, Kim SS, Kim MH, Yang WS. Surgical Methods of Zygomaticomaxillary Complex Fracture. Arch Craniofac Surg. 2016 Dec. 17 (4):206-10. [Medline]. [Full Text]. Farber SJ, Nguyen DC, Skolnick GB, Woo AS, Patel KB. Current Management of Zygomaticomaxillary Complex Fractures: A Multidisciplinary Survey and Literature Review. Craniomaxillofac Trauma Reconstr. 2016 Nov. 9 (4):313-22. [Medline]. Stanley RB Jr. The zygomatic arch as a guide to reconstruction of comminuted malar fractures. Arch Otolaryngol Head Neck Surg. 1989 Dec. 115(12):1459-62. [Medline]. Zingg M, Chowdhury K, Ladrach K, Vuillemin T, Sutter F, Raveh J. Treatment of 813 zygoma-lateral orbital complex fractures. New aspects. Arch Otolaryngol Head Neck Surg. 1991 Jun. 117(6):611-20; discussion 621-2. [Medline]. Lynch DJ, Lamp JC, Royster HP. The conjunctival approach for exploration of the orbital floor. Plast Reconstr Surg. 1974 Aug. 54(2):153-6. [Medline]. Tessier P. The conjunctival approach to the orbital floor and maxilla in congenital malformation and trauma. J Maxillofac Surg. 1973 Mar. 1(1):3-8. [Medline]. Converse JM, Firmin F, Wood-Smith D, Friedland JA. The conjunctival approach in orbital fractures. Plast Reconstr Surg. 1973 Dec. 52(6):656-7. [Medline]. Mueller R. Endoscopic treatment of facial fractures. Facial Plast Surg. 2008 Jan. 24(1):78-91. [Medline]. Walter WL. Early surgical repair of blowout fracture of the orbital floor by using the transantral approach. South Med J. 1972 Oct. 65(10):1229-43. [Medline]. Gillies HD, Kilner JP, Stone D. Fractures of the malar-zygomatic compound with a description of a new x-ray position. Br J Surg. 1927. 14:651. Bagheri SC, Meyer RA, Khan HA, Steed MB. Microsurgical repair of peripheral trigeminal nerve injuries from maxillofacial trauma. J Oral Maxillofac Surg. 2009 Sep. 67(9):1791-9. [Medline]. Matsunaga RS, Simpson W, Toffel PH. Simplified protocol for treatment of malar fractures. Based on a 1,220-case, eight-year experience. Arch Otolaryngol. 1977 Sep. 103(9):535-8. [Medline]. Eisele DW, Duckert LG. Single-point stabilization of zygomatic fractures with the minicompression plate. Arch Otolaryngol Head Neck Surg. 1987 Mar. 113(3):267-70. [Medline]. Karlan MS, Cassisi NJ. Fractures of the zygoma. A geometric, biomechanical, and surgical analysis. Arch Otolaryngol. 1979 Jun. 105(6):320-7. [Medline]. Chuong R, Kaban LB. Fractures of the zygomatic complex. J Oral Maxillofac Surg. 1986 Apr. 44(4):283-8. [Medline]. Ballenger JJ. Diseases of the Nose, Throat, Ear, Head, and Neck. 14th ed. Philadelphia, Pa: Lea & Febinger; 1991. Nasr WF, ElSheikh E, El-Anwar MW, Sweed AH, Bessar A, Ezzeldin N. Two- versus Three-Point Internal Fixation of Displaced Zygomaticomaxillary Complex Fractures. Craniomaxillofac Trauma Reconstr. 2018 Dec. 11 (4):256-64. [Medline]. Sato A, Imai Y, Muraki K, Tachi M. Reliability of Ultrasound-Guided One-Point Fixation for Zygomaticomaxillary Complex Fractures. J Craniofac Surg. 2019 Jan. 30 (1):218-22. [Medline]. Kim HJ, Bang KH, Park EJ, Cho YC, Sung IY, Son JH. Evaluation of Postoperative Stability After Open Reduction and Internal Fixation of Zygomaticomaxillary Complex Fractures Using Cone Beam Computed Tomography Analysis. J Craniofac Surg. 2018 Jun. 29 (4):980-4. [Medline]. Lund K. Fractures of the zygoma: a follow-up study on 62 patients. J Oral Surg. 1971 Aug. 29(8):557-60. [Medline]. Lundin K, Ridell A, Sandberg N, Ohman A. One thousand maxillo-facial and related fractures at the ENT-clinic in Gothenburg. A two-year prospective study. Acta Otolaryngol. 1973 Apr. 75(4):359-61. [Medline]. Larsen OD, Thomsen M. Zygomatic fractures. II. A follow-up study of 137 patients. Scand J Plast Reconstr Surg. 1978. 12(1):59-63. [Medline]. Dingman RO, Natvig P. Surgery of Facial Fractures. Philadelphia, Pa: WB Saunders Co; 1976. Wavak P, Zook EG. Immobilization of fractures of the zygomatic bone with an antral pack. Surg Gynecol Obstet. 1979 Oct. 149(4):587-9. [Medline]. Davidson J, Nickerson D, Nickerson B. Zygomatic fractures: comparison of methods of internal fixation. Plast Reconstr Surg. 1990 Jul. 86(1):25-32. [Medline]. Luck JD, Lopez J, Faateh M, et al. Pediatric Zygomaticomaxillary Complex Fracture Repair: Location and Number of Fixation Sites in Growing Children. Plast Reconstr Surg. 2018 Jul. 142 (1):51e-60e. [Medline]. Song SH, Kyung H, Oh SH, et al. Fixation of fractured anterior wall of maxillary sinus using fibrin glue in a zygomaticomaxillary complex fracture. J Craniofac Surg. 2014 May. 25(3):919-21. [Medline]. Lederman IR. 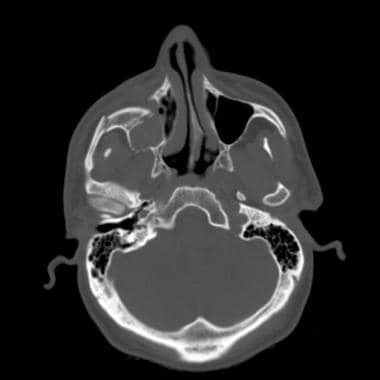 Loss of vision associated with surgical treatment of zygomatic-orbital floor fracture. Plast Reconstr Surg. 1981 Jul. 68(1):94-9. [Medline]. Crumley RL, Leibsohn J, Krause CJ, Burton TC. Fractures of the orbital floor. Laryngoscope. 1977 Jun. 87(6):934-47. [Medline]. Dingman RO, Natvig P. Surgery of Facial Fractures. Philadelphia, Pa: WB Saunders Co; 1964. 212-213. Appling WD, Patrinely JR, Salzer TA. Transconjunctival approach vs subciliary skin-muscle flap approach for orbital fracture repair. Arch Otolaryngol Head Neck Surg. 1993 Sep. 119(9):1000-7. [Medline]. Wray RC, Holtmann B, Ribaudo JM, Keiter J, Weeks PM. A comparison of conjunctival and subciliary incisions for orbital fractures. Br J Plast Surg. 1977 Apr. 30(2):142-5. [Medline]. Patel BC, Patipa M, Anderson RL, McLeish W. Management of postblepharoplasty lower eyelid retraction with hard palate grafts and lateral tarsal strip. Plast Reconstr Surg. 1997 Apr. 99(5):1251-60. [Medline]. Perino KE, Zide MF, Kinnebrew MC. Late treatment of malunited malar fractures. J Oral Maxillofac Surg. 1984 Jan. 42(1):20-34. [Medline]. Kim DH, Kim RH, Lee J, et al. Evaluation of soft tissue asymmetry using cone-beam computed tomography after open reduction and internal fixation of zygomaticomaxillary complex fracture. J Korean Assoc Oral Maxillofac Surg. 2014 Jun. 40(3):103-10. [Medline]. [Full Text]. Pham AM, Rafii AA, Metzger MC, Jamali A, Strong EB. Computer modeling and intraoperative navigation in maxillofacial surgery. Otolaryngol Head Neck Surg. 2007 Oct. 137(4):624-31. [Medline]. Intraoperative photograph of a titanium plating for rigid fixation of a zygomatic-maxillary buttress fracture in a complex maxillary fracture. Coronal CT scan demonstrating displaced right zygomaticomaxillary complex fracture. Note the associated orbital floor fracture.